- Tough textured coating which is very durable, chemical resistant and scratch resistant. It contains a special granules, which gives an attractive tough-textured appearance that protects the surface from rust,scratches, and other damages. 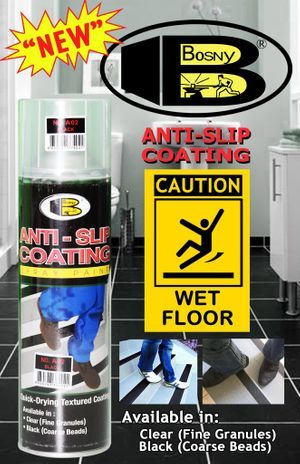 - It can be applied on various surfaces such as truck beds, furniture's, motorcycle parts, bumpers, computer cases, desks and cabinets, heavy machinery, SUV's, AVT's, Army Trucks, and any objects that need special protections against abrasions. Available in two shades, black and clear, for black shades, the end result is a textured rough with larger beads. Bosny Anti-Slip Coating also can be used as a truck bed liner. Clear color comes with smaller granules.